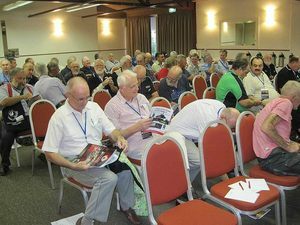 108 people were registered for the 2011 WIA Annual Conference held in Darwin on 27, 28 and 29 May 2011. After registration at the Travelodge Mirambeena Resort on Friday afternoon participants enjoyed a buffet dinner at the Darwin Trailer Boat Club. Highlights of the evening were the sun setting over Fannie Bay and an address by the Lord Mayor of Darwin, Graeme Sawyer, who spoke of the top end weather and ecology and the depressing damage cause by the cane toad. On Saturday the formal Annual General Meeting was followed by the Open Forum. WIA Merit Awards were presented and are detailed in a separate release. Papers presented to the Open Forum had been distributed to participants before the meeting. In addition to the statutory financial, directors and audit reports the papers submitted to the Open Forum included an additional report from the President and reports in respect of ARDF, ARISS, Assessments, Awards, Bookshop, BPL and Standards, Clubs, Contests including the John Moyle, the Remembrance Day Contest, the Ross Hull Contest, VHF-UHF Field Days and Oceania DX Contest, D-Star, Emergency Communications, Historian, IARU Region 3, the Monitoring System, ITU and WRC, National Technical Advisory Committee, QSL Bureau, Repeaters and Beacon Coordination, Webmaster, WIA Centenary and WIA National News. The need to attract young people to amateur radio emerged as a theme linked to many of the issues raised. Following discussion of contests, unanimous support for the RD contest to start at around lunchtime emerged. Saturday afternoon was devoted to a symposium, led by David Donnelly VK8DON who described the role of Bushlight in bringing renewable energy to remote communities. Darwin Amateur Radio Club President Spud Murphy VK8ZWM spoke of amateur radio and other things in the Top End. 106 people sat down to a successful dinner on Saturday night, with the highlights of Doug McArthur telling stories of radio and amateur radio in old Darwin, and well known singer and local amateur John Mitchell VK8JM providing memorable entertainment. On Saturday night the venue for the 2012 Annual Conference was announced as Mildura, Victoria, on the weekend of 26/27 May, supported by the Sunraysia Radio Group. Sunday saw a visit to Litchfield National Park, the magnetic termite mounds, a visit to Florence Falls and a Barbecue at Wangi Falls provided by members of the Darwin Club, and Sunday evening saw the end of the conference with another sunset and a meal at the Mindil Beach Sunset Market. WIA President Michael Owen VK3KI said that the weekend was an outstanding success thanks particularly to the dedicated band of helpers from the Darwin Amateur Radio Club, the work of WIA Manager Mal Brooks and the many others who contributed. He said that it was laid back event that captured the atmosphere of the Territory. It was attended by amateurs from every state and territory except Tasmania and even an amateur from New Zealand. The members of the Darwin Amateur Radio Club, its President Spud Murphy, its Secretary Peter Blackadder, the drivers, the barbecue experts, those who looked after the drinks the people who looked after the partners, even meeting everyone on arrival at Darwin airport made 2011 yet another memorable year.